I should explain. This is Drunk Hulk. He has a Twitter account. He is singing that terrible Cure song. Drunk Hulk remarks on the news of the day, but occasionally lets his green hair down and takes song requests. The other day, Drunk Hulk did a mean Toto and Lady Gaga. Not bad! Now for the rest of this week's whimsy. What is the definition of "unbenounced"? Urban Dictionary knows all. Here's every pop culture cartoon face, morphed at warp speed for seven minutes. This will mess with your head. But later, you'll love taking screen shots. Feel the soft little bag where Dmitri hides his shameful money. He wears the bag around his neck. It is full of rubles. Why doesn't Dmitri save himself? Best stained glass church window, ever! This might have kept me going to church. 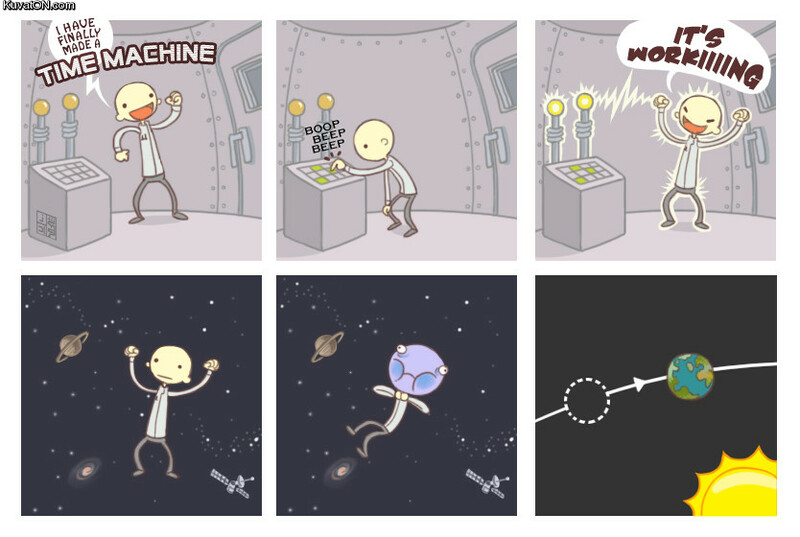 Time machine caveat. That's it - no more dreaming of time-travel for me. And, in case you need something to do this weekend, and you're feeling lucky, there's Ask Sleeves, the mp3 finder. Have fun! Two readers told me they used to look forward to Friday Blasphemy on this blog, though they went on to say they would sit far back from the screen in case of the mighty lightning of God's retribution. Inspired by the idea I have readers who actually believe lightning can travel through the internet and hit them (even if they were only kidding), I have hereby assembled a humble hodge podge of heretical humor. Hello!? It's actually the atheists who are deluded. This video will prove it. Bill O'Reilly goes nuts on Inside Edition. Okay, yes, everybody's already seen this, and no, it's not religious fare. But it made me like O'Reilly just a little tiny bit, which, as we all know, is liberal heresy. I swear, once school is over and my sense of humor is no longer a danger to others, Anthony and I will create some parody religious tracts and get them ready for net-wide distribution. The day is coming! Until then, we'll have to be content with other people's works of genius. The mighty blogger Humuhumu has posted a reprint of a tract called simply Tiki, in the hope that some of us will see the Light, and not be tempted by Satan into the pagan world of fruity drinks and temperate zones. You Are the Very Gay Velma! She might not even realize it... But Velma is all about Daphne... not Fred! I'm not in an industry that rewards artistic creativity in any wayshapeorform, but if I were, I think this might be a great ice-breaking business card. Are Your Cats Old Enough To Learn About Jesus? Kittens' hearts, at birth, are filled with what theologians call "original mischief." Mischief, if left to grow on its own, can sprout into evil. That's why you must fill their hearts with Jesus instead. If you wait, your cats might find seductive role models among the back-alley strays and rough felines from the wrong side of town. You could also end up with an unwanted pregnancy. And what would a saved kitty family hang next to their scratching post? This picture, obviously. JesusPets is a company that will ensure that the dogs and cats of born-again Christians will be cared for after their owners have been Raptured up to the streets of gold. Isn't that nice? Then there's always The Cats of God. Yeah. I'm sorry in advance. Plans for Holy Land theme park on Galilee shore where Jesus fed the 5,000. Q: What rides should they have at the biblical theme park? On Sunday, 'mouse shares his birthday with the Baby Jesus! In his honor ('mouse's) (unless the Baby Jesus also likes the blues), a birthday song. Now that I think about it, if anybody has the right to sing the blues, it's the Baby Jesus. 'Son you do what I say. I'm sure some of you have seen this, but I'm charmed by the discovery of my first UU holiday carol. For the trip would take too long. That's what I said. No 'Christmas' in this greeting. I'm a heathen on the edge, tearing away at the moral fabric of our society with my blatant inclusiveness. The radical Right be darned! Of course, Daisy here knows the Reason for the Season. But she also has no opposable thumbs and can't type. So what I blog, goes. REV. SUN JUNG MOON AND HIS WIFE ARE OUR BELOVED TRUE PARENTS (defined here in the traditional sense of one man as “father”, one woman as “mother”, joined in matrimony under the current laws stemming from a paternalistic tradition; you may wish to consider accepting the Moons as “parents” in a rhetorical sense if they did not literally conceive or adopt you), WHOM WE OBEY WITH ABSOLUTE FAITH AND UNSWERVING FEALTY (after a heartfelt personal quest) AS THE BRINGERS OF THE ONE WHITE TRUTH (which is not intended to malign truths of other colors). OUR CELEBRATION WILL BRING TOGETHER UNITARIAN-UNIVERSALIST-UNIFICATIONISTS FROM ALL OVER THE WORLD (if they choose to attend) TO WORSHIP THE TRUE PARENTS AND PARTICIPATE IN A COMPULSORY(-ish) COLLECTIVE PRAYER (&/or interpretive dance) WHICH WILL HASTEN THE COMING OF THE DAWN OF A NEW GLOBAL ERA OF THEIR GLIMMERING BENEVOLENT RULE (following a quorum and fair election, and with the understanding that we will never impinge upon the rights and values of non-UUU members) !!!!!! 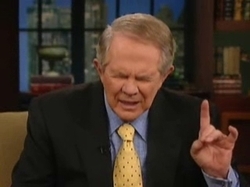 THURSDAY, DECEMBER 1, 9:00 A.M.
Covert Satanist Pat Robertson Flashes Devils Hand. I'd've gauged myself as more easygoing than even this description. For instance, the question about my kid in a nativity play? They didn't include my favored answer - I'd be charmed to see Bunny cast in a nativity play, but I'd devote at least one dinner conversation to the nativity legend throughout history. Also, I'd swap with another parent for sewing duties, because oddly, I don't make clothes - only quilts. Interesting quiz and not the normal superficial Quizilla variety. But I'm not an atheist. Atheism is as restrictive a box as fundamentalism. Are the terms 'humanist' and 'atheist' interchangable? I am so very sorry that we tricked your son Jody into surrendering himself unto the bosom of Jesus Christ. Who knew he’d actually fall for it? I mean really. Look, I don't want to keep posting this stuff, honestly. I don't exactly go looking for it! (Well, yeah, okay, sometimes I do.) But when it shows up, one way or the other, I have to share. Well, I don't care if it rains or freezes/ Long as I have my plastic Jesus/ Riding on the dashboard of my car/ Through all trials and tribulations/ We will travel every nation/ With my plastic Jesus I'll go faaar. Dashboard Jesus and Disco Santa make any party better. D.J. and D.S. meet the Thunder from Down Under. A. An atheist with children. ... you think socks are too formal for a Summer service. ... you know at least 5 ways to say "Happy holidays!" ... your idea of a guy's night out is going to a N.O.W. rally. ... unleavened bread is part of your Easter Brunch. ... you refer to construction paper as "paper of color." ... the name of your church is longer than your arm. ... you find yourself rewriting a church survey, rather than taking it. ... you call up your minister in the middle of the night, panicking because you are STARTING to believe in God. ... you feel the need to use interpretive dance to explain your religious convictions. It has been my life-long goal to spread the word of Lord Saget, and I vow to keep on spreading the love until every soul has been saved. Millions of people all over the world have already joined our forces. It took some convincing, but after looking deep into their hearts, even the biggest non-believers eventually turned toward the light. It's impossible to deny the power of our chosen LEADER, after all, there isn't a man or woman on earth who can make you smile quite like BOB SAGET! Praise 'Bob'! I have seen the light! And in the spirit of 'Full House' worship, let me ask you: WWUJD?